What does emergent curriculum mean? Thanks to Amy Zvonar, our Lead Educator for writing the thoughtful piece excerpted here. The children, Amy, and the AFK flag the children decorated. I want to share with you our discussion in this week’s blog, and reflect on just how valuable it is to listen to children’s ideas, allow them to express their theories, and give them the space and tools they need to test these theories out for themselves. It is so important to allow this process to happen, instead of just telling children information and expecting them to absorb it. During our morning discussion, I learned so much about the children in the group and how they think and feel. It made me excited to see how they were incorporating information from so many different experiences to have a lively discussion about our topic: snails! We did not start out talking or intending to talk about snails. Our discussion got started with the topic of our new play space. The teachers decided to move the children to a new side of Ayeli to play on in the morning, and we wanted to know what the children thought about it. What did they discover? Did they get to explore it much? What other parts of it did they want to see? We didn’t have much time to explore and play this morning, so we wondered what were the things they might want to do when we play there again? Some of the things children had done that morning were climb the trees, check under logs for insects, and find some very big snails. Amy asked what they thought about the snails, and thus our snail discussion began. W mentioned that he thought snails did not like dirt, and Amy asked why he thought that. He explained that he had seen a show and that snails didn’t like dirt in it. E chimed in to say she had seen a show and that snails lived in water and could move and swim with bubbles. This idea seemed to reinforce W’s idea that snails didn’t like dirt, but C spoke up and mentioned that he thought snails did like dirt. C repeated his idea, and did not allow any of the other children to change his mind. He had seen snails in the dirt, and so he knew snails liked dirt. Several other children agreed with C, that they had seen snails in dirt. One child mentioned, “but they make slime in dirt.” Amy wondered at this point if some snails could like dirt and some snails could not like dirt? Our children who had already taken sides on the dirt vs. no dirt were not ready to budge their thinking, but some of the other children in the group thought that they might. Amy acknowledged both W’s thinking and C’s, and then put forth the thought that perhaps there might be a way to figure out an answer out in the woods. How could we test out our idea? Children mentioned that we could look for snails, and Amy ended the discussion with the lingering thought that we could try and see where snails were living in the woods to test out our ideas. 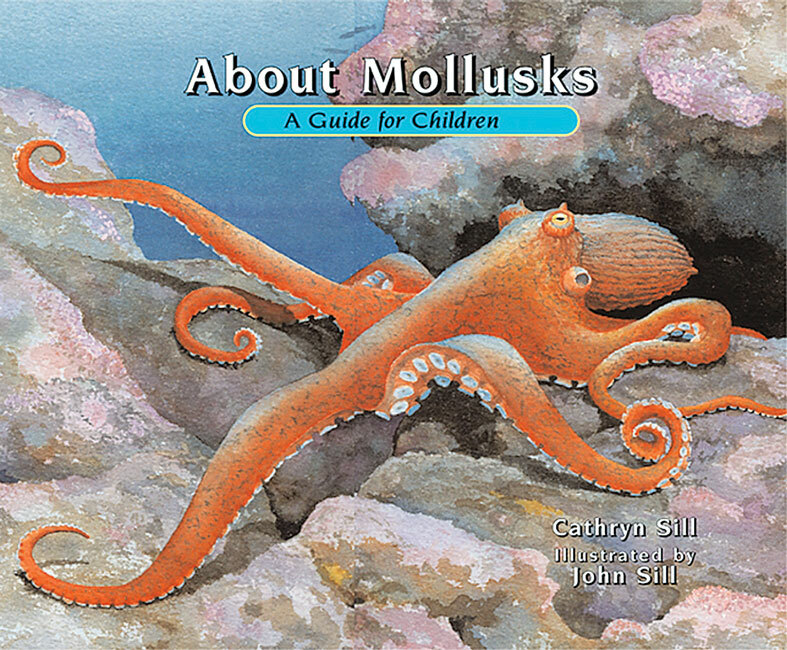 We did read a book at snack time, and one happened to be a book with information about snails: About Mollusks, by Cathryn and John Sill. This was completely coincidental. The book is one of Amy’s daughter’s favorites and it just called out to Amy in the morning to be brought to AFK! During this discussion, the children illustrated how they are actively thinking about the natural world and trying to use information from many sources to figure things out. They are also willing to enter into discussion and disagreement with each other, and to stand firm on their beliefs. At the same time, they remain open to the idea of testing their theories out and getting more evidence and information to evaluate their beliefs. How fantastic that we are able to spend time on these discussions, without having to rush the children to learn a certain fact or standard. Amy will definitely bring up our snail discussion again, perhaps this week since we might have a rainy day again- and the snails might be out for us to investigate our ideas!! It is especially exciting to think about next year, when we will meet twice a week and we can return to our ideas and hypotheses right away to continue investigating and extending our learning! Just some girls doing science! It is always interesting as a teacher to read information like this, and think about how we approach it in our own space. Certainly looking for snails and wondering where they like and don’t like to live is doing science, and I will keep looking for all the other ways we do science at AFK! Amy truly is a gifted educator; she views education as a dynamic interplay among teachers, students, and parents. She is always challenging herself to learn and grow, and I can't wait to learn from her and grow with her myself! As your forest kindergarten teachers, Amy and I are excited to get to know you and co-create AFK with each of you.